The first meeting was held this afternoon by Magistrate Judge John M. Facciola, who was appointed by Judge Emmet G. Sullivan to manage and assist in discussions between Judicial Watch and the IRS about how to obtain any missing records which have been the subject of longstanding Judicial Watch Freedom of Information Act (FOIA) requests and lawsuit (Judicial Watch v. IRS (No. 1:13-cv-1559)). Judge Sullivan has encouraged Judicial Watch to submit a request for limited discovery into the missing IRS records after September 10. Fitton was remarkably restrained in his characterization of the revelation by the IRS attorneys. 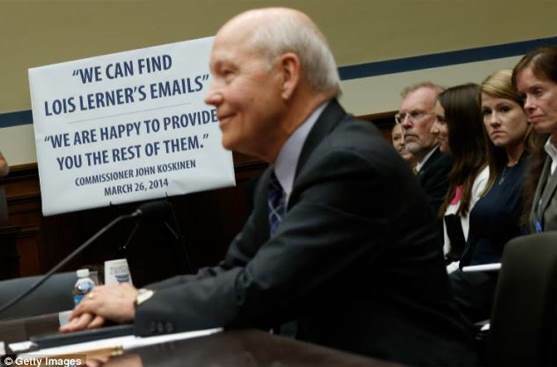 From our perspective not only has this revelation turned the entire IRS email investigation on its head, but we are reminded of the arrogant smirk on the face of IRS Chief John Koskinen's face as he testified before Congress that Lois Lerner's emails could not be recovered. It seems to us that if he was aware of this back-up system (and how could he not be) his false testimony should earn him a an indictment for lying to Congress and a place beside Attorney General Eric Holder as one of the most infamous liars ever to occupy a Senate confirmed position in the government of the United States. Click this link to view must see video of Judicial Watch's Tom Fitton explaining the significance of the IRS admission. Submitted by David Givens on Tue, 08/26/2014 - 12:52. Why aren't Lois Learner and John A. Koskinen being charged with perjury like I would be if I ever lied under oath? Submitted by mikey on Wed, 08/27/2014 - 08:18. Because the "elite" protect each other.